The following is a Video thank you from MsDragonfly who won first prize in the Pick What You Win Art Giveaway. When I ship art I always ask the person who bought it or won it as is the case here to let me know when it arrives. This helps me keep track of shipping times from me to you and also just to know that it did indeed arrive and wasn’t lost in the mail. On a practical note . . . I was thrilled with how quickly, efficiently and graciously you handled our project together. Your skills and talents are impressively evident when looking at your work in all contexts. You seem to understand your medium(s) intimately and were willing to experiment and try different things, always responding kindly to my concerns and suggestions. I greatly appreciated how dedicated you remained despite being ill and losing your dear cat McGandy in the midst of our process together–not to mention the fact that this was all happening during the holiday season! Everything was accomplished much sooner than I expected given the obstacles that appeared along the way. These last few months are turning out to be some of the best and most memorable months for me in terms of art creation, exposure and hence gratitude. It’s so easy these days to become overwhelmed with emails, blog postings, comment moderation, facebook, flickr, features, etsy, galleries, friends, family, *dating and the responding to such. Throw into that mix, a few bad apples and I do become depressed or anxious at times as people or situations are not always what you want them to be. Occasionally, it can be down right nasty what people say to you. Some months (almost a year) back a wonderful Theme Designer and blogger friend of mine named Amos Moses Griffin designed a WordPress theme using my illustrations and art. He asked my permission to use them in that theme. I gladly, had said yes. It is called The Tao of You. At the time of this theme’s birth I was in another world. Well, maybe not another world, but the world around me was collapsing and it was all I could do, to scramble and keep my head afloat above water without resorting back to my old ways of dealing with life’s issues and down times. So, go and read this man’s blog and especially have a look at his themes. His poetry rocks to. Thank you Amos. I never forgot. 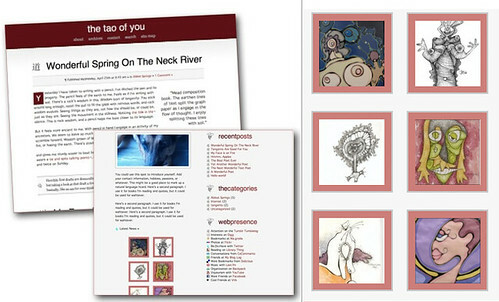 I was tickled pink that you had thought of me to feature as a visual artist in one of your WordPress themes.